Silas is introduced in Acts 15 verse 22; To say the least he lived an exciting life, if we look at Acts 16 to 18; Silas was apart of a deliverance ministry, for which He and Paul were beaten and thrown in jail. That would be enough to make one think, what they have got involved in, but instead in jail. Paul and Silas were praying and singing, and at midnight they were delivered from jail themselves, by an earthquake. 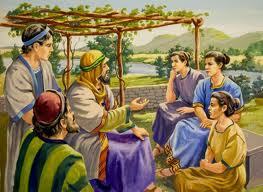 Silas was first appointed a delegate, to convey a decree from the Jerusalem church to Antioch. Silas remained in Antioch, because shortly after he joined Paul on his second missionary journey. He was a leader in the Jerusalem church. A trusted person, who was given a task, to deliver a message to the Gentile believers in Antioch. Worked as a writing secretary for both Paul and Peter. He was a Roman citizen, who accepted Christ Jesus. One of the hardest things to understand: God never guarantees that His followers will not suffer. Silas was a good worker, and is a significant part of effective ministry. His obedience to his calling, often meant giving up what makes us feel comfortable and secure. V25: “About midnight Paul and Silas were praying and singing hymns to God and the Prisoners were listening to them”. V26: Suddenly there was such a violent earthquake that the foundations of the jail were shaken, and immediately all the doors were opened and everyone’s chains came loose”. Faith in the darkest Hour, will bring results. Be richly blessed by Silas’ life.